Alec Aunan led the Gusties, tying for third place. MONTICELLO, Minn. – The Gustavus men’s golf team turned in a team score of 294 Friday to finish third in a triangular with Augsburg College and Saint John’s University at Monticello Country Club. Augsburg and Saint John’s each posted team scores of 291 to tie for first place. Alec Aunan (Jr. Rock Island, Ill.) led the Gusties, firing a team-low and tying a season-low score of 72 to tie for third place. Chris Captain (Jr., Rochester, Minn.), Ben Hauge (Fy., Ramsey, Minn.), and Alex Koopmeiners (Sr., St. Cloud, Minn.) followed Aunan, posting rounds of 73, 74, and 75. 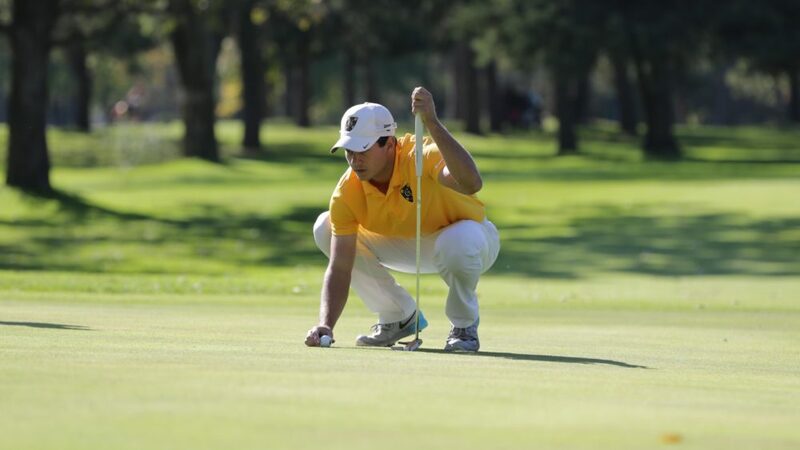 Sam Majka (Sr., Wayzata, Minn.) also competed in the top-five for the Gusties and turned in a score of 81. In addition, Max Savini (So., Ramsey, Minn.), Blake Heiman (Jr., River Falls, Minn.), and Parker Tinsley (Sr., Bloomington, Minn.) participated as individuals. They turned in scores of 76, 79, and 85. Gustavus next prepares for the Bobby Krig Invite April 23-34. The Gusties host Sunday’s first round at The Ridges at Sand Creek in Jordan, Minn. and Monday’s final round at Le Sueur Country Club in Le Seuer, Minn.